We Help Nepal was featured in the San Francisco Chronicle's Sunday newspaper! Read the story about how WHN members Christine Kolisch and Mitch Silver helped connect Sumita Davis with her family in rural Sindupalchowk. Two months after the set of earthquakes that rocked Nepal on April 25 and May 12, Sumita Davis was sitting at a cafe in Kathmandu. Cracks were visible in the walls as she sipped her tea, her tiny 5-foot frame bundled in a down vest. Davis, 57, moved to San Francisco in 1982 with her former husband, an antique art dealer. Her small apartment in the Presidio was a meeting place where expatriates like herself mingled with the hippies who gave Kathmandu’s famed Freak Street its name, drinking tea, speaking Nepali and remembering their home in the Himalayas. When the first earthquake hit Nepal, it was a matter of hours before this same San Francisco Nepal network reconnected. Davis reached out to Mitchell Silver, a friend and former hydro power expert who had served in Nepal, and told him she intended to return there to help her family. Silver had been in touch with Christine Kolisch, a Carmel Valley resident who ran an art gallery in Kathmandu in the 1970s and, after the quake hit, launched We Help Nepal, a fundraising platform. Within weeks, Silver had raised $54,000 through the organization and headed to Nepal. He called Davis from there. The conversation took place on June 2, one week before Davis’ flight to Kathmandu. Davis comes from a small village called Bratho in the remote area of Sindhupalchok, one of the districts the disaster hit hardest. Comprised of mostly Tamang families, a minority ethnic group in Nepal, her village is a six-hour walk from the nearest access road in Bothang. Davis has 14 aunts and uncles and eight brothers and sisters living in Sindhupalchok. Add in-laws, and there are enough nieces, nephews and cousins to populate a village. Eight villages, to be exact, all within walking distance of each other. While everyone there knows her as the cool auntie who made it to America, her role comes with a price. Like many Nepalis, Davis is part of a diaspora that has intensified over the years. According to the International Labor Organization, nearly one-third of all Nepali families have a household member working abroad, and remittances account for 21 percent of Nepal’s gross domestic product. During the earthquake, 23 of her family members died, and four suffered major injuries. “I had to go,” she said. When Davis met Silver in Kathmandu on June 14, it had been years since they’d seen each other. Their plan was to purchase enough supplies to sustain the 186 households in Bratho and its surrounding villages for two months. That evening, they loaded a truck with more than 11,000 pounds of rice, nearly 900 pounds of dal, 55 gallons of oil, 44 pounds of chili, 66 pounds of garam masala, 186 bars of soap and packages of laundry detergent. At daybreak, the relief party set out. Like many remote areas affected by the quake, aid and supplies were slow to arrive to Bratho. The first relief came from Copan Monastery on May 13, nearly three weeks after the primary quake and a day after its powerful aftershock. The World Food Program estimates that the quakes destroyed approximately 80 percent of the houses in the Sindhupalchok region, and that even now food needs remain urgent. Understanding the danger of the terrain, Davis took it upon herself to help. Her decision to deliver aid to her village was characteristic of the wider civilian response to the earthquake that has come to define the crisis. The overall response, in some ways, was necessary. Nepal is a country that is currently operating without a Constitution, and bureaucratic red tape is rampant. “The government can’t move as quickly as individuals in Nepal,” said Kesab Regmi of the Institute of Crisis Management Studies at Nepal’s Tribhuvan University. As the Jeep rattled along the road from Kathmandu to Bothang, Davis texted with family members awaiting her arrival. A week earlier, she had called her sister to set the date that the caravan would arrive. 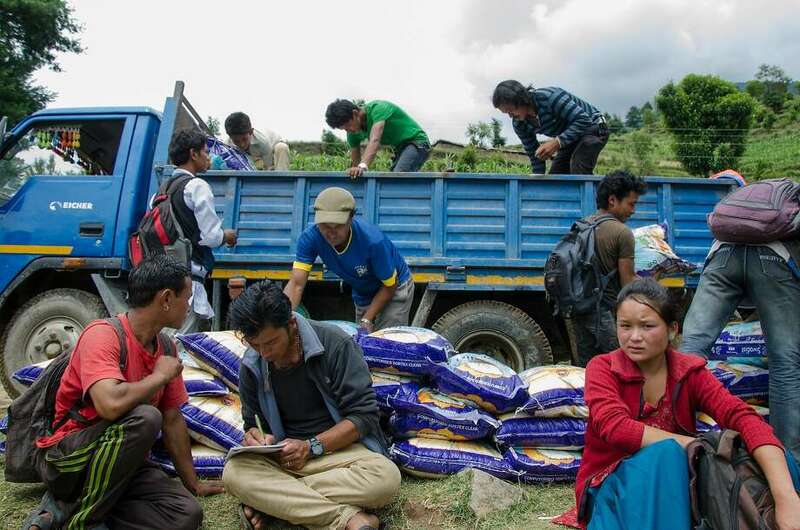 When the truck reached Bothang, 157 people were waiting. From this point onward, the only way to the villages was to walk. As the truck was unloaded, young men and women strapped sacks of rice to their backs and set off together. Davis joined them. Along the way, they would drop off supplies at each village. They had walked all morning to get there. Now they would walk all afternoon to get back. The journey to Bratho is approximately 7 miles from the end of the road in Bothang, but it takes at least six hours to walk that distance. The route goes down the side of a steep valley, crosses a river, then climbs the other side of the valley, reaching ever deeper into the Himalayas. The journey is treacherous and, despite knowing the way, Davis looks warily at the cliffs as she walks. Visible cracks line the path up the cliffs, indicating there will be landslides when it rains. In one village, Rildutara, three people were killed, including the parents of Tashi and Priya Tamang, ages 10 and 8, who have been taken in by Davis’ cousin. In Yangri, at the base of the mountain, 70 people had built shelters among the remains of their homes. The group reached Bratho at nightfall. More than a month after the first quake, her family had not yet received relief money promised by the government, or any delivery of housing supplies from large aid organizations. The new sacks of rice were opened immediately for dinner. Afterward the family sat on a patchwork of carpet and foam matting, talking into the night. In the morning, Davis made an offering at the old Bodhi tree in the middle of the village before starting her return. Of the nine houses in her village, none remained. Amid the rubble, scattered rice seeds were sprouting into seedlings, taking root in the broken mud walls. Life, it seems, goes on. Back in Kathmandu, Davis is staying busy. The four seriously injured members of her family are still in hospitals in Kathmandu, and she visits them regularly. She’ll remain in Nepal until Aug. 3, when she has to return to school at the College of Marin. After a career as a health worker and a caretaker, she has decided to return to school to study hotel management. Meanwhile, she is sorting out a living situation for six nieces and nephews who are in Kathmandu. Finding them a place to live and a way to enroll them in school has been her primary occupation. Many people have come down from the hills, unable to reconstruct their houses during the monsoon. At this point, they’re waiting it out. Original link to story, photographs, and video here.